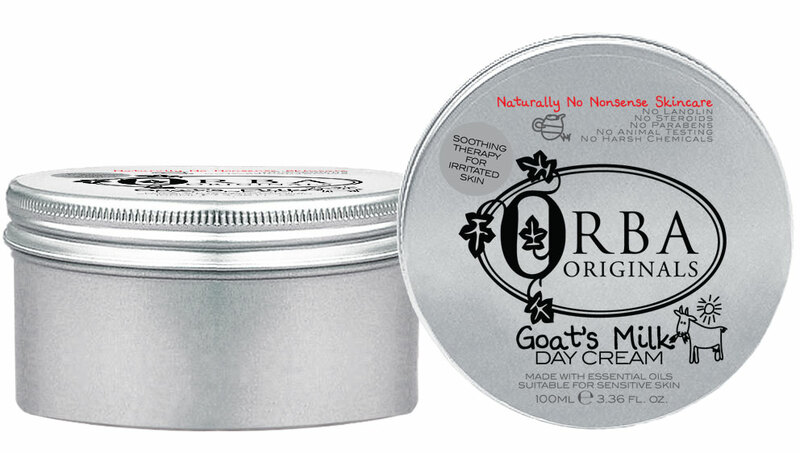 Goat's Milk Cream Goats Milk Skin Care  - £12.99 : Orba Originals - Naturally No Nonsense Skincare! Soothing Cream fortified with Vitamins A, B6, B12 and E to ease Eczema symptoms. Formulated using goat’s milk, Vitamins A, B6, B12, Vitamin E and Cocoa butter this cool, rich and creamy formula provides deep skin moisturizing penetration. This versatile therapy can be used all over the body including the face, around the eyes and ears and is light enough to use under make up every day. Many of our satisfied customers have testified to the soothing relief that this cream has given them for Psoriasis, Eczema, Rosacea, Dermatitis and very dry skin but it is designed to provide deep skin moisturizing penetration for ALL skin types. A soothing antidote to the symptoms of irritation commonly associated with Eczema, and other problematic skin conditions, Orba Original's Goat's Milk Day Cream contains the added goodness of cocoa butter to help nourish healthy skin and heal rough patches. As with most dry irritable skin conditions, the key to alleviating flare-ups lies in keeping skin hydrated to discourage the overproduction of skin cells which causes flaking skin and the itchiness associated with it. Goat's Milk Day Cream effectively penetrates into the deeper levels of skin to target the areas lacking in moisture to hydrate the areas most in need. With frequent application skin is calmed and PH levels are effectively rebalanced as Goat's Milk has a PH level very similar to humans. "I would like you to know that I am so pleased to have found your Goats Milk Moisturising Cream, and in the last 3 months since starting to use it, have found it invaluable. I suffer from a form of excema around & above my ankles, which in the past has not responded well to various prescription ointments. I do find, however, that an application of your cream gives relief from the itching & burning, allowing me to sleep better, & makes the skin less dry & more supple. Thank you for your prompt & courteous mail order service." "I came across your product at Greenwich Market about a month ago. I suffer with Dermatitis and have found the product to be extremely effective. Many thanks,"